The BirdRock Home Round Cloth Laundry Hamper with Handles is a great addition to any bedroom, laundry room or bathroom. The Hamper features durable cloth handles, making it extremely easy to carry your dirty laundry to the washing machine. The hamper is made to fold and bend simply and store easily in small areas. With a simple and unique design, you may now stow away dirty clothes in a stylish hamper. Constructed from a blend of polyester and cotton canvas, the hamper offers you a durable yet lightweight solution to organizing your dirty clothes. The hamper can fit 1 standard sized load of laundry. Our laundry hamper will help you keep your home organized without being a big eye sore. Helps keep clothes off the floor by offering a single location for your dirty clothes. 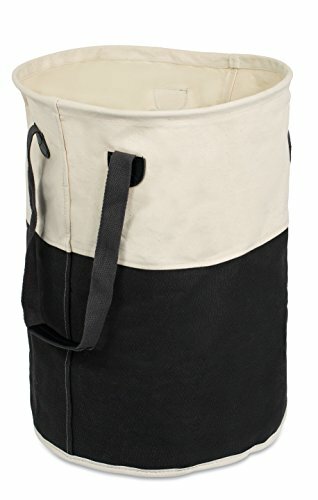 Durable and Lightweight: Created to be lightweight with unique cloth handles for ease of transportation yet durable for frequent use in your bedroom, laundry room or bathroom. Spacious Interior: the single laundry hamper can hold up to 1 load of dirty clothes. Clothes Organizer: helps keep dirty laundry neat and tidy without being an eye sore.